Coast rhododendron flowers; photo by Jeanne Roe on Flickr (noncommercial use permitted with attribution / share alike). Also called Pacific rhododendron, or big leaf rhododendron, the coast rhododendron is a broadleaf evergreen rhododendron species native to western North America. 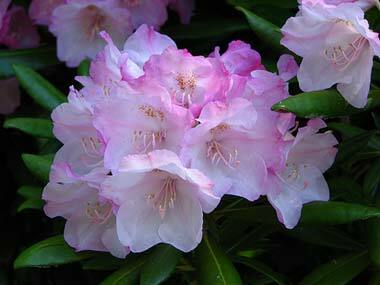 The coast rhododendron is found primarily near the Pacific coast, but its range extends to the Cascade Mountains in Oregon, Washington and British Columbia. Coast rhododendron is less popular for decorative landscaping than many other rhododendron species that are easier to grow and have a more pleasing appearance (Pacific Rhododendron shrubs can be scraggly and the flowers are often much less impressive than those of its relatives). Archibald Menzies found this shrub in 1792 when he and George Vancouver landed near present day Port Discovery. 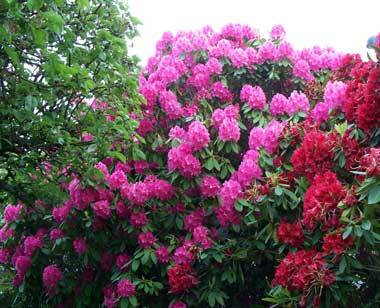 Coast rhododendron seeds were sent to England in 1850 by William Lobb. Tall rhododendrons from a home in Lynnwood, Washington - photo by TriviaKing.